Most people who really know their NYC brunch spots have probably heard of Penelope – it’s got the rep for being an excellent resto. So why, you ask, has someone like me never been? My only answer: the wait! C’mon – if you’re anything like me, the fear of arriving hungry to brunch only to find a 2 hour wait for a table is just too much to bear. 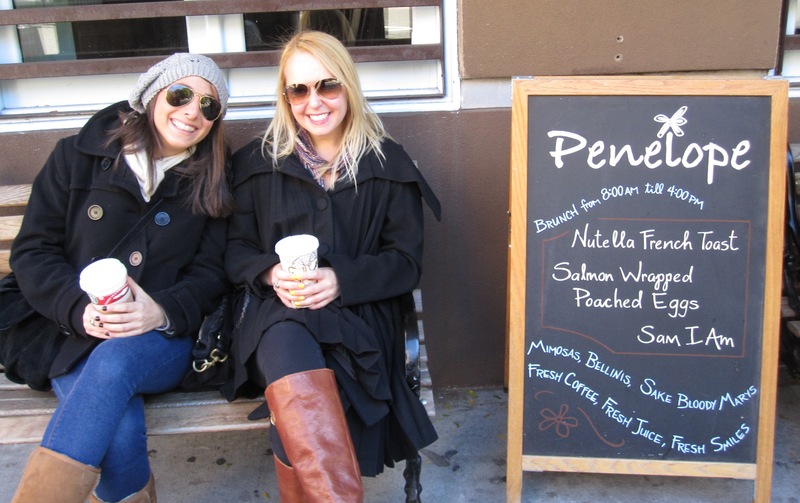 But this weekend, my team of researchers and I set out on a mission to try the mythical brunch goddess that is Penelope. My dedicated troops, Rachel and Amanda, swore they would wait with me to the death through the notorious 2 hour wait time. We decided that with the Marathon and gorgeous weather, the odds of a shorter wait would be in our favor. When we arrived at 12:45pm, I was told we would have a 1 hour and 15 minute wait – ok, not as bad as it could be – but imagine our surprise when at 1:05pm (after just 20 minutes!) my name was called. It was GLORIOUS! The place is the kind of cute you associate with Martha Stewart sets (did you see what a little gingham did for that prison cell!?) and with the reasonable $14.50 prix-fixe, there’s no white collar crime happening here. 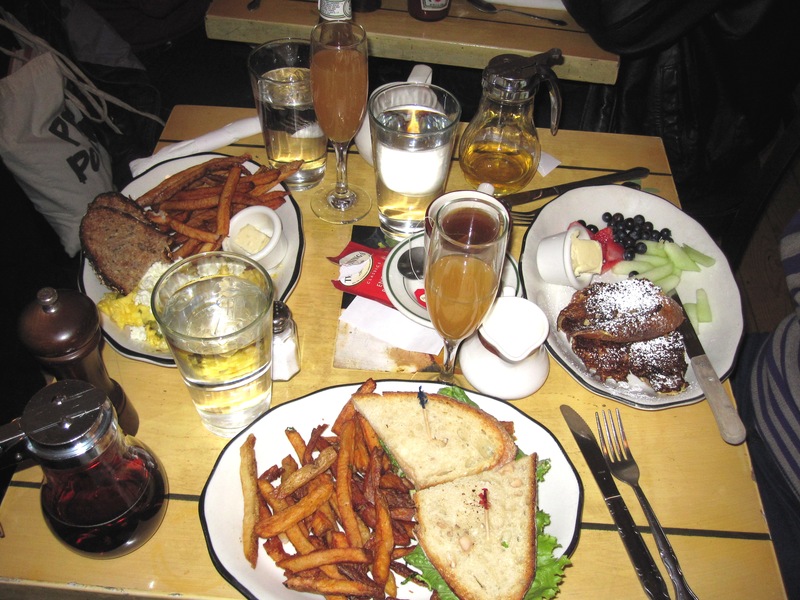 The prix-fixe brunch items come with a complimentary Apple Cider Mimosa!!! Tasting neither too apple-y nor heavy on the champagne (shucks), it was actually the perfect fall brunch cocktail (I thought about re-creating it later in the day, but it just wouldn’t be the same). Being a vegetarian, I heard the FBLT (Fakin’ Bacon, Lettuce & Tomato Sandwich) was great and it did not disappoint – this was a ridiculously delicious sammy. It came with a side of fries, which were ok – a little salt went a long way. Rach had the Nutella French Toast which was pretty small but packed a big punch of YUM. Amanda had the Sam I Am Omelet with asparagus and feta (which was sprinkled on the top, so you really got the taste – rather than having it melted in, which can mask some of the flavor). All in all, I’m really glad I had my first date with Penelope, and even more glad that we only had to wait 20 minutes. BUT, I’ll go ahead and tell it straight: Penelope, any woman that makes you hang around for 2 hours probably isn’t worth the wait at all. So, make sure you go on a holiday weekend to avoid the hungry masses – that’s when you’ll find me back for seconds! ← Deal Seeker Double Take!